Here at Corona, we help organizations make strategic decisions via our research and strategy services. But individuals can also use research to make strategic decisions. We read a lot these days about the cost of higher education. While rises in health care costs get more attention, inflation in higher education costs have actually outpaced them, and the unprecedented question has begun arising about whether an education is worth the cost in modern America. We have researched supply and demand issues, and have seen evidence that college grads are increasingly competing for jobs that traditionally haven’t required a college degree, and that many college grads are displacing workers without degrees in those positions. That’s not quite the door-opening experience that we would hope to see coming with a college degree, but nonetheless we see that, on the whole, people with higher education levels have more earning power and better employment prospects. 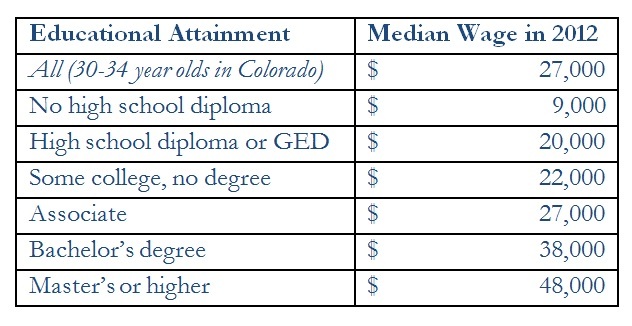 We recently did a quick analysis of wage and salary levels by education level for Coloradans between the ages of 30 and 34. At this age, most people have completed their education, and by controlling for age we can eliminate some factors such as older people being less likely to have degrees. We included all people in this age range, including those who aren’t working, to account for the fact that employment opportunities may differ by age level. As a quick back of the envelope analysis, we looked at the reported resident tuition and fee costs of public schools as reported by the Colorado Commission on Higher Education. We then added the lost earnings of pursuing education beyond high school, assuming two years of lost earnings for an associate degree, four years for a bachelor, and seven years for an advanced degree. We ignored living expenses since you’re presumably buying groceries and housing whether you go to college or not. If you compare those costs to the income differential, we see a payback period of roughly 6 to 7 years for any type of post-secondary degree, assuming that you get no financial aid during your college years. The earning power of lesser degrees is lower, but the cost and time to get them is lower, and they even out. And obviously there are factors that we didn’t consider in this quick analysis, such as the type of degree a student earns. But as a general rule, unless you plan to retire at 30, it’s pretty clear in this simple analysis that there’s a positive long-term financial payoff to pursuing higher education. So for any of our blog readers considering the return on investment of college, we’ve done the data crunching, so you can now use it to make your strategic decision.